This photograph was taken by Don McCullin during the Vietnam War (1955-1975). It shows McCullin's ability to reveal the human consequences of war. The power of the image stems not only from the depiction of a dead man, but also from the way in which McCullin composed the scene. He used stark black and white photographic paper, since he believed that black and white has an impact on the viewer that colour cannot match. The photographs and other personal items are placed in the foreground and are lighter in tone and sharper in focus than the man's body. Their significance - telling us that the North Vietnamese soldier is a husband and father - gives the picture added poignancy. The small loose photographs are all scattered image-side up, suggesting that McCullin may not have found the scene exactly as we see it here. 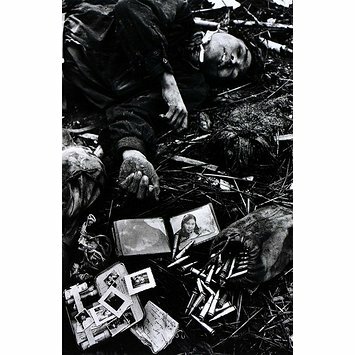 Black and white photograph of a dead soldier surrounded by scattered possessions. In 1968 Don McCullin had joined a battalion of American marines (he had full official accreditation to do this) as they crossed the Perfumed River to the city of Hue which had been captured by a regiment of North Vietnamese soldiers. The Americans anticipated that they would easily reclaim the city, but suffered heavy casualties and the city was destroyed. This image is highly representative of McCullin's ability to show the human consequences of war. The power of the image to affect us comes not only through the depiction of a dead man, but the way in which McCullin has composed the scene. He uses stark black and white photographic paper, since he believed that black and white has an impact on the viewer which colour could not match. The composition of the image is also a crucial part of the image's power. The photographs and other personal items are placed in the foreground and are lighter in tone and sharper in focus that the man's body. It is the delayed impact of realising the significance of the objects; that the North Vietnamese soldier is a husband and father makes this image have such resonance. Perhaps McCullin did not find this scene exactly as we see it. The small loose photographs scattered over an opened tin are all image side up. There is a sense that the objects are displayed for us to read. Does this devalue in any way the image as a whole? This image was a double-page spread in the Sunday Times Magazine. It had accompanying text. To a certain extent reportage photography needs some form of written explanation. We need to know who the dead man is, in order to understand fully the image's meaning. This image as you are seeing it has been taken out of its original context. The intention is not to 'elevate' the photograph onto purely aesthetic grounds, but to emphasise McCullin's sophisticated graphic style alongside the image's value as document. Don McCullin's significance as a photojournalist began in 1964 when he was sent by The Observer to cover the civil war which had just started in Cyprus. For the next twenty years McCullin worked mainly for the Sunday Times Magazine, photographing sites of human and ecological disaster. His work of this period is primarily made for multiple publication, for mass consumption and awareness. His assignments include the Vietnam War, the Nigerian civil war, uprising in Cambodia (1970-75), famine in Guatemala (1971) and poverty in northern England (1976-8). Since 1985 McCullin has devoted his time to other subject matter such as landscapes and still lifes, as well as commercial photography.